The state of unrest continues in the Indian held Kashmir and the massive civilian uprisings are shaking the Indian control on this disputed region. The civilian uprising of 2016 and the lowest electoral turnout in the latest by poll election held in April followed by unabating state wide students’ protests against the aggressive posturing of Indian forces have unnerved the policy makers in Delhi. Indian state has hardened its stand, refusing to talk and is working on what has described as ‘Doval Doctrine’, which principally stands for irrelevance of morality, extremism freed from calculation or calibration, and reliance on military might. India has reinforced its faith in perception management and repressive laws to silence the popular demand. This approach has failed to end the massive public resentment and Indian state has called its army for the maintenance of law and order issues. This has come to fore after Indian paramilitary forces failed to put an end to the civilian protests though they continued to use the lethal weapons like pellet guns. Civilian protests in demand for political rights are observed as law and order problems by the Indian state in Kashmir. The continued use of force has meanwhile made the people of Kashmir equally fearless and today, even the Indian army finds itself at odds. The army has now resorted to the use of ‘innovative’ means to instil fear in the people. Practicing the innovation, on April 9, 2017, an Indian Officer tied a 24-year-old shawl weaver named Farooq Ahmad Dar to the front of a jeep, using him as a human shield, and the army defended the use of Human shield as a tactics, which in fact was a violation of the Geneva conventions. 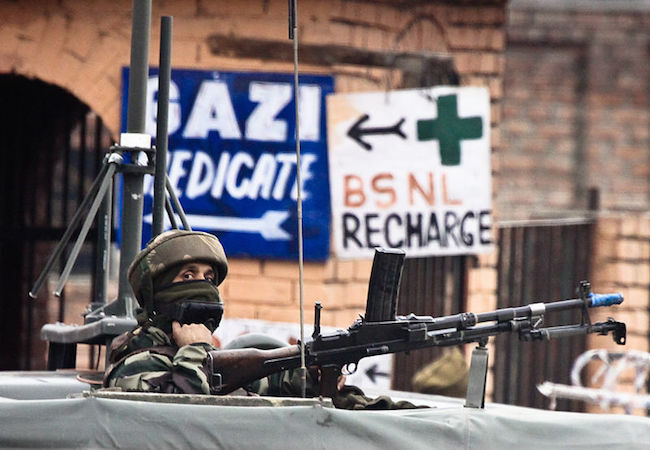 This innovation has been described as ‘Cruelty and Cowardice in Kashmir’ by the editorial board of The New York Times stating that the members of India’s armed forces have reached a new low in the long history of alleged human rights abuses. By now, the Indian state has started theorising a different language and its Defence Minister while justifying the use of a Kashmiri civilian as a Human shield argues that Kashmir is a war-like zone and army doesn’t have to consult members of Parliament under these circumstances. The nature of this war zone was explained by Indian CAOS Bipin Rawat, who said, ‘this is a proxy war and proxy war is a dirty war. It is played in a dirty way. … You fight a dirty war with innovations’ and use of Human shield is only an innovation. He awarded the Officer Major Leetul Gogoi, who used a civilian as human shield; even though the court of Inquiry set up by the army itself was yet to complete. This has yet only exposed the farcical inquiry system. Keneth Roth, the human rights watch executive director aptly described Indian Army Chief as ‘Criminal Leadership’ in this regard. The people of Kashmir are finding the General Dyer of British India in the Indian military regime. Contrary to what India aims to achieve by the use of force, the widely celebrated notion in Kashmir is that the brutal face of India along with its aggressive majoritarian Hindutva mindset cannot crush the civilian movement for the right to self determination in Kashmir. It is argued that India has used its entire military means since 1989 and has failed to curb the legitimate political demand of the people of Kashmir. Today, the fourth generation of Kashmiris is fighting India in Schools, Colleges and in the by-lanes of villages and cities. With stone in their hand, and clad in the uniform, the valley’s new generation is making clear statements that they cannot be cowed down at the point of gun. India is left with little options, and it is high time to shed the arrogance of power and start treating Kashmir from a humanistic perspective that seeks a political resolution. Indian state has tested wars, black laws, military might, presidential rules, sadbhavnas and other covert options, and peoples’ demand for their political rights has not subdued. The global community should not allow India to orchestrate a suppressive tactics that ultimately corners the youth to resort to extremist means, though India appears interested in the same as reflected by the CAOS Rawat’s statement saying, “In fact, I wish these people, instead of throwing stones at us, were firing weapons at us. Then I would have been happy”. The international community must intervene before an enforced radicalisation is used to demonise a political demand and ways are created to kill people en-masse in the name of terrorism, though the fact is that Kashmir is a political dispute and it needs a political resolution. Force cannot kill aspirations, it only makes them forceful. Faheem Abdul Muneeb hails from Indian-held Kashmir and is currently pursuing a Master’s degree in Political Science from Jamia Millia Islamia, New Delhi. He works on Conflict Resolution Studies and Political Dialogue and has written for The Dawn, Pakistan and the local news papers in Kashmir.